← AUSTRALIAN GP – BEHOLD, THE ICEMAN IS BACK! 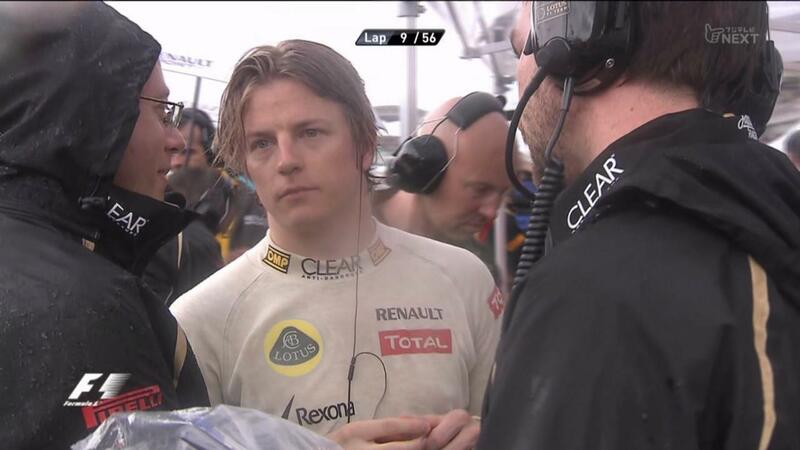 Last time we were in Malaysia with Kimi we were treated with the now infamous “icecream incident”. The race had been stopped due to a crazy downpour. People were waiting for the race to restart and we see Kimi with an icecream in hand and helping himself to a coke in the fridge. Some people called that a sign of lack of motivation. But that only makes them blithering idiots that dont care to seek out the truth. His car was done due to a KERS issue and was asked to retire the car. And the cause? Electrical fault in a fridge.. There is an obvious joke in there somewhere. Meaning he had to approve of it or they would not have put his name there. “Dear media friends”.. Right. Well, enough of that. His weekend got off to another bad start with a 5 place grid penalty for a gearbox change. And reports of problems with his KERS. His steering is still not quite to his liking either. At least they changed the floor of the car and with some other changes the car got a lot more to his liking during the practice sessions. Qualification went a whole lot better than in Melbourne last week. Didnt take much to do that of course, but Kimi made it safely into Q2 with a single hot lap on the harder tire. Sweet. Then came Q2. On with the softs. He is one of the first to go out. And bam! Quickest man in all of Q2. Oh to see his name graze the top of the sheets like that really got me dreaming. Is pole possible? How fast IS that Lotus! Will we ever frickin know?? Q3 comes on and he does a good lap that is even faster than his Q2 but had to correct a couple of places which cost a couple of tenths. Furthermore he is on the exact same time as Mark Webber but he got 5th grid position instead of 4th still. Possible because Mark set his time first. Im not sure to be honest. But 10th on the grid it was. As the race is about to start the rain starts to drizzle. Most people put on intermediates and finally the lights go out. McLarens in front again – but Grosjean shoots from 6th to 3rd! His happiness is cut short when he first spins out and takes Schumacher with him. Then on the third lap he ends up in the gravel and retires from another race. Kimi is threading carefully. And yet maintaining his 8th position while feeling the tires. What is astonishing is that he has never run on these wet tires before except an installation lap. Let me repeat that. Never. And now he is thrown into a crazy wet race and told to race them in anger. Lets not forget that he has just one race under his belt after being 2 years away from the sport. Hello.. But apparently Kimi needs 3 laps of just about anything and he is then pretty much good to go. I am not joking here. That is exactly what he does. Learning new machinery. A new track, new tires. It doesnt matter. Whatever it is, it comes down to his unbelievable talent and uncanny feel for the car. No fuss. No bragging. In fact, I doubt he even thinks about it too much. It comes to him naturally and it has always been like this for him. The rain falls harder and people start to put on full wets. 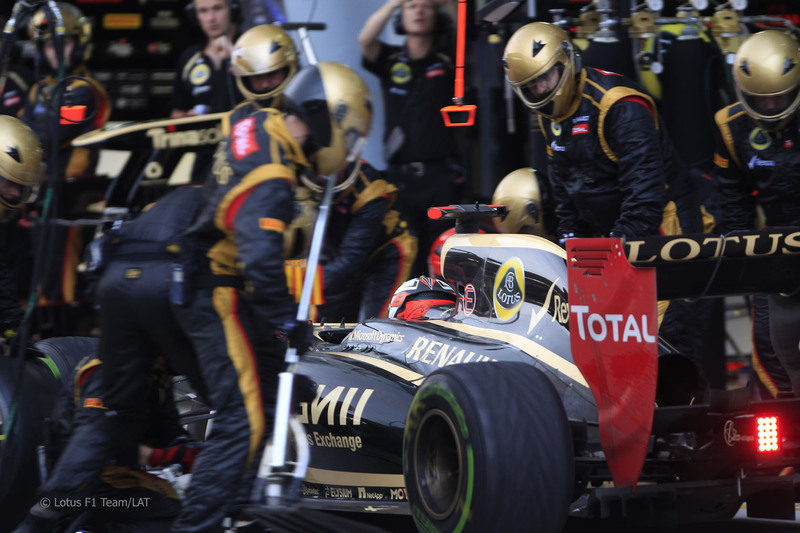 The Lotus team keeps Kimi out for 2 laps longer than they should and he drops from 8th to 13th after his stop. This happened just before the race is eventually red flagged for about 50 minutes because of wild downpour. During the delay, we learn through team radio that Kimi has no KERS.. The race is restarted and after the safety car pulls in, the cars start to change from wets to intermediates. Kimi is in a Red Bull sandwich and putting some pressure on Vettel. Vettel manages to pass Rosberg ahead and so does Kimi down the pit straight. Goes on the outside and gets the inside for turn 2. Brilliant. Up to 5th. Webber behind is not able to keep up at this stage of the race. The race itself was going great until Perez, who was the fastest driver today, got a badly disguised order to maintain his 2nd position because “we need the points”. This is only because the Ferrari powered Sauber team was told to play nice by their engine suppliers who are currently shitting their pants because they have yet again failed to deliver a car that can challenge for the championship. What is left is a bunch of headless chickens running scared in Maranello while the pressure intensifies for every passing year. So Perez was told off over the radio and this obviously made him lose his concentration and subsequently the race as he went wide just a lap or two later. But what a race the little Mexican had. I sense that a baby with a lisp is soon to be replaced by him. As for Kimi, he kept his position to the end. The Red Bull of Webber came in for slicks one lap before Kimi and that was enough to jump ahead of our favorite Finn. Still a fantastic result. Melbourne was a great return. But this race really showed more of the stuff that Kimi is made of. He passed cars, had the same pace as the McLarens and Red Bulls for most of the race. Set the fastest lap too on lap 53. I ask myself how he was able to do these things if his KERS was not working? I admire the guy but to pull this off it must have at least been working at some stages. Right? Perhaps someone knows if this was the case. Edit: As the rain eventually ceased his KERS got working again. Enjoyable semi-crazy race. Its a 7 out of 10 for me. Which goes down to a 1 out of 10 due to yet another race being decided by shady orders in the red corridors. But then it gets up to 8 out of 10 due to Kimis interstellar performance while hauling his car through ever changing conditions on never before raced wet tires and a working/non-working KERS. Overcame a 5 slot grid penalty, slow pitstops and bad strategy calls from the team to finish 5th! Clearly the driver of the day if there ever was one. Well done Kimster! Now like yourself, we hope for a more “normal” race in China in 3 weeks. Go Kimi Go!! 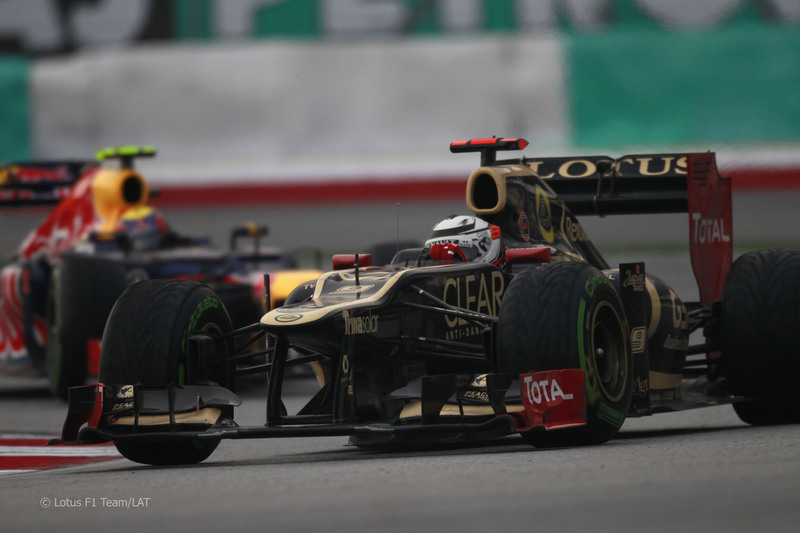 This entry was posted in Uncategorized and tagged cars, kimi raikkonen, lotus team. Bookmark the permalink. I was happy with Kimi’s result today and that’s why I voted 10. But the race wasn’t what I really want it to be, that HRT sure cost Vettel some nice points there and I am a bit mad about it. Also there is this Perez’s case, obviously even DC predicted this message from team radio will come soon considering Ferrari and Sauber has long term contract for Ferrari engine. At the tip of my tongue I want to say this is a team order but saying so might be harsh. But we never know though… Perez would be happy to settle second but who wouldn’t want to win? I didn’t said he run wide on purpose but he got pressure from the message. He has the speed and ample time to chase Alonso, so… yea. Nevertheless, good to see Kimi improved from 7th to 5th. He is already back on track with full Iceman package. Now this just make me so want to see the next race soon enough. Good review as always, Soren. Cheers. Im pretty sure he didnt run wide on purpose. But Im sure his concentration took a hit with such a pathetic radio message. It should have been “Go get him son! Youre much faster! Take him on the straight!” or something like that. 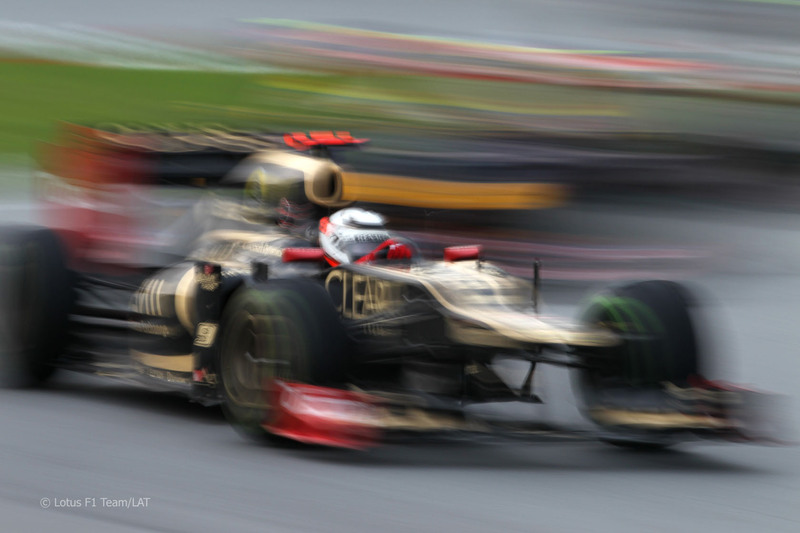 kimi stamps his authority with fastest lap on only his second race back?? the iceman known as the kimster doesn’t let up until hell freezes over… 10 out of 10 for me soren! Heheh. I can feel your enthusiasm. We love to see him light up the track and the sectors. That is just what the doctor ordered! I look forward to your Kimi-centric GP reviews! Amazing point about Kimi never having been on those tires. It was pure delicious eye-candy. Now I am addicted and need another shot of Kimi awesomeness. Bring on China! this was meant to be a 10 (points race) out of ten (grid position), so I vote for a 10 too even if I would not be a Kimi centric observer 😉 ! I have to admit that Alonso drove a great race. Just massively disappointed in Sauber or whoever was behind that pitiful team radio. The fastest guy didnt win. But I guess that is nothing new in F1. 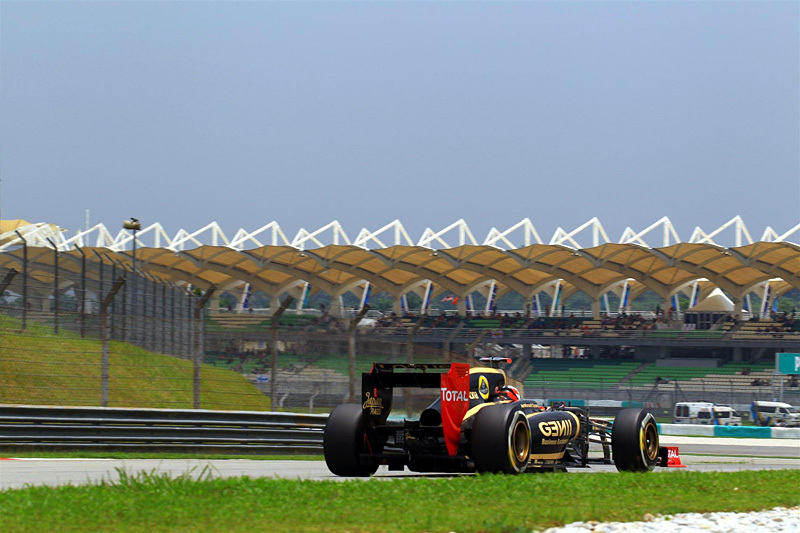 I was really happy with his driving at Sepang, and seeing him the fastest man at Q2 was just WOW!! I believe he will catch his pace in China and for coming races. Lets hope for normal conditions, a clean getaway and a possibility to hopefully see Kimi set the track on fire!! Kimi is ever the phenomenon, isnt he. Over a decade later and he is still making people scratch their heads.